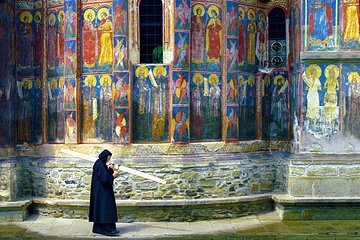 Admire os Monastérios Pintados de Bucovina em um tour privado de um dia inteiro pela cidade romena. As oito igrejas da Moldávia, tombadas como Patrimônio da Humanidade, são reconhecidas pela UNESCO para seus afrescos dos séculos XV e XVI, conhecida como a arte bizantina magnífica. Você visitará os mosteiros Voronet, Humor e Moldovita com comentários perspicazes sobre sua história e arquitetura, com o seu guia pessoal. Faça uma parada em Marginea para ver como a cerâmica preta rara é fabricada por artesãos locais. Transporte de ida e volta do aeroporto de Iasi ou hotel incluído. Highly recommend! The three monasteries that we visited were breath-taking, and our guide Iulian was knowledgeable and very helpful. Lunch was delicious, too! I would like to take the time and recommend this tour for anyone that wants to discover the beautiful Romania. This tour was very pleasant was very informative, and very well organized so I would like to recommend it to everyone. Also I would like take the time to tell you about our guide Mr. Niku . Never before I met such a guide. This guide working for Rolandia tours is the most informative the most humble guide I have ever met. He took us to the Bucovina area he was our driver and our guide. This is one of the most recommended guide that you must take when you arrive to the Iasi area . When you do and take Rolandia tours as your agency ,please ask for Mr. Niku to be your guide. You will never be sorry taking this guide, I fully recommend this tour for anyone and I fully advice everyone who takes this tour to ask for Mr.Niku to be your guide. Very nice tour. Our guide, George, was very knowledgable, considerate, and a good driver. The monasteries were worth seeing. We would recommend this tour highly.